Aside from the awesome views, it's an architectural marvel! Let's take a look inside. 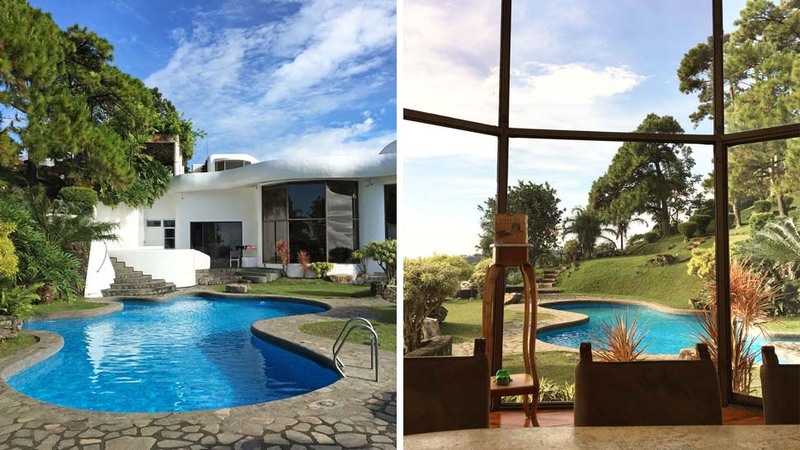 A rest house near Manila that could fit big groups, and is a stunning, tastefully decorated architectural creation—sounds like a rare gem in the lineup of so-so airBnb’s we usually see. 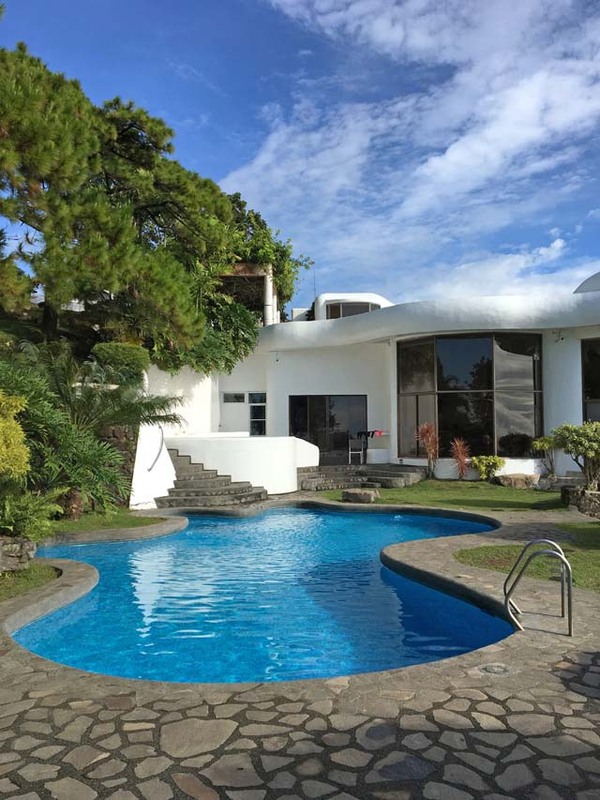 But this dream rest house exists in the form of Raffi’s Way, an organic-modern rest house located in Tagaytay. Our Real Living contributing stylist and interior designer Tala Singson spent a weekend at Raffi’s and gushed over the house. 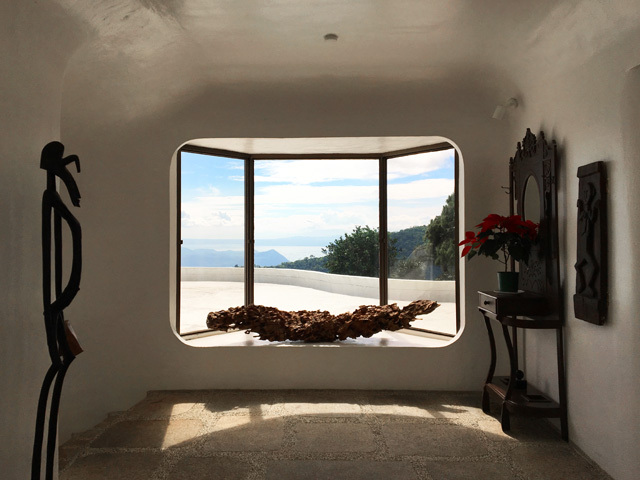 “Initially, I anticipated another house inspired by Santorini because of the white-washed stone architecture, but as you move around the place, I felt more as if I've traveled back in time because of the (very) subtle midcentury-modern vibe,” she says. 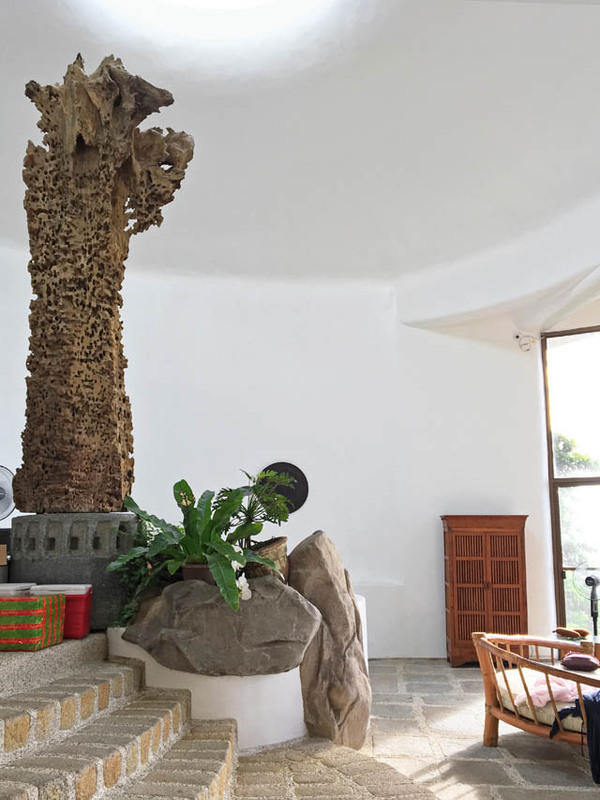 In its previous websites, the four-bedroom, multi-level villa was described as a “Santorini-inspired, Balearic-style” house, meaning it was designed in the Greek-Mediterranean style. 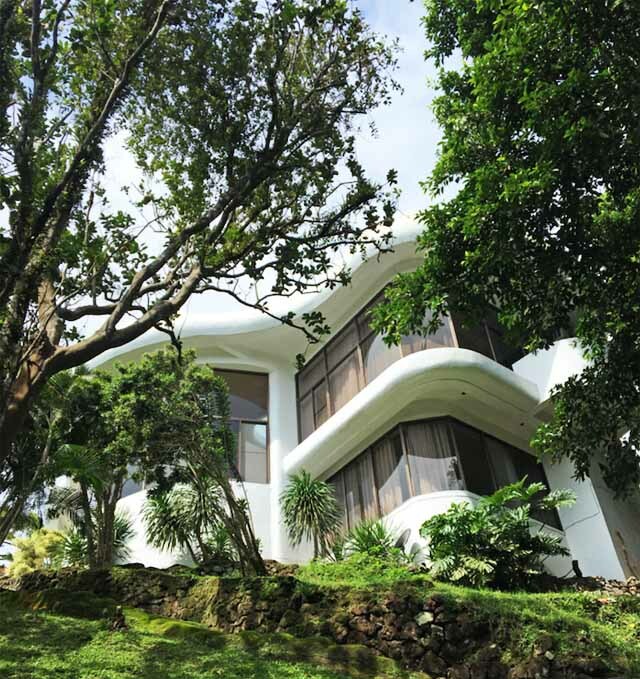 The smooth, undulating curves and rounded layout and massing of the house exhibits a more organic-modern style of architecture. The private outdoor pool (organic-shaped, as well) overlooks Taal Lake. This spot is dramatically lit up at night—perfect for cool, poolside parties. The main foyer even has a view. This room leads to the stairs that goes down to main living and dining areas. 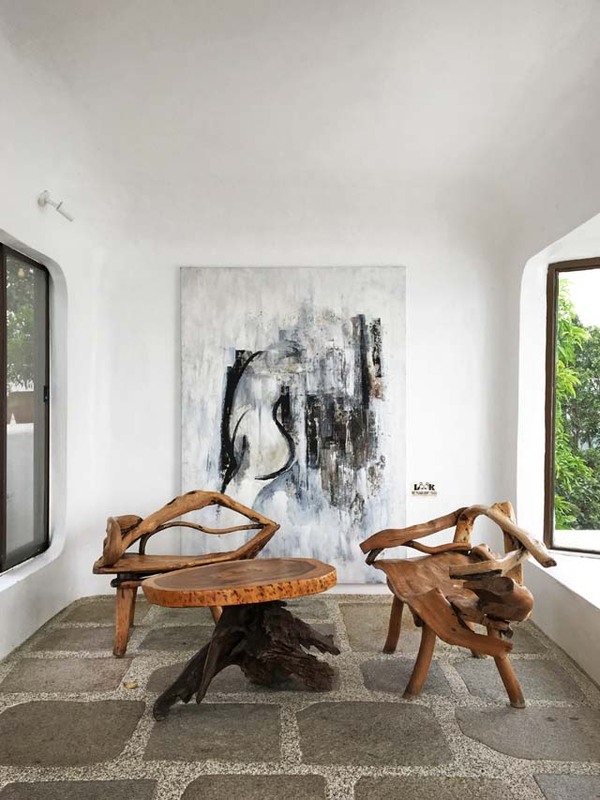 An abstract painting and rustic driftwood furniture make for simple but sculptural pieces in the foyer. 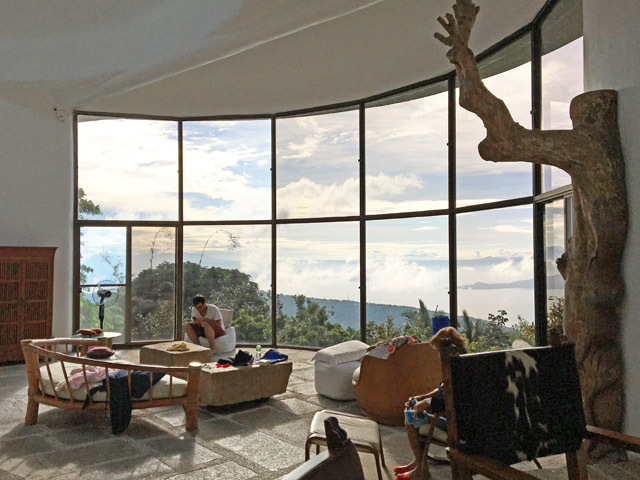 The main living area, decorated with oversized stone and bamboo furniture, overlooks Taal Lake and its volcano. 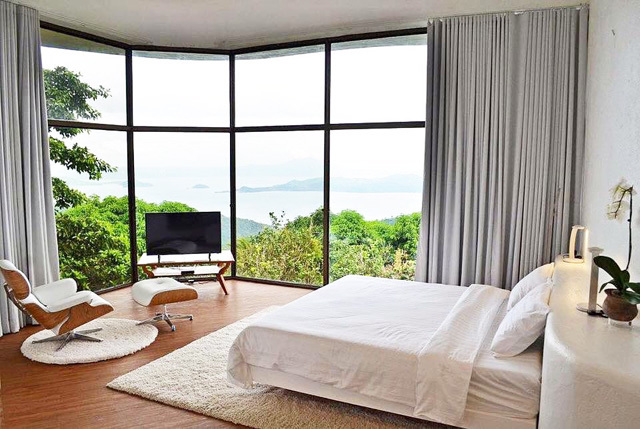 “The big windows make you want to look outside all the time, too. It feels grand, but feels very cozy and casual. The high ceiling and huge windows makes the house feel very open, plus, it gets a lot of sunlight,” Tala says about the space. Right next to the living area is a petrified tree trunk below the house’s oculus, that serves as a sculptural accent. 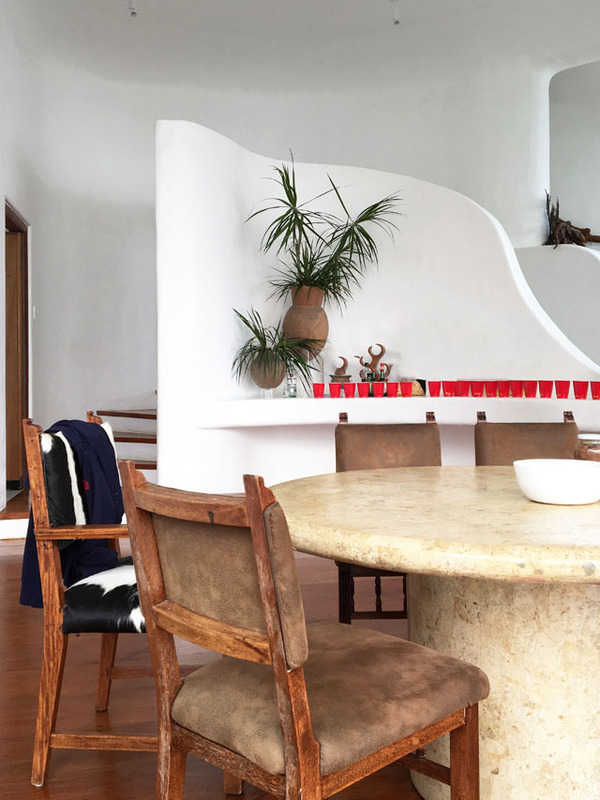 Curved wall partitions and a stairwell corral in the dining area, which is furnished in a rustic, Greek-by-way-of-Santa-Fe style with a massive stone table and cowhide chairs. “The architecture of the house has an international style, almost futuristic, but still current and local. 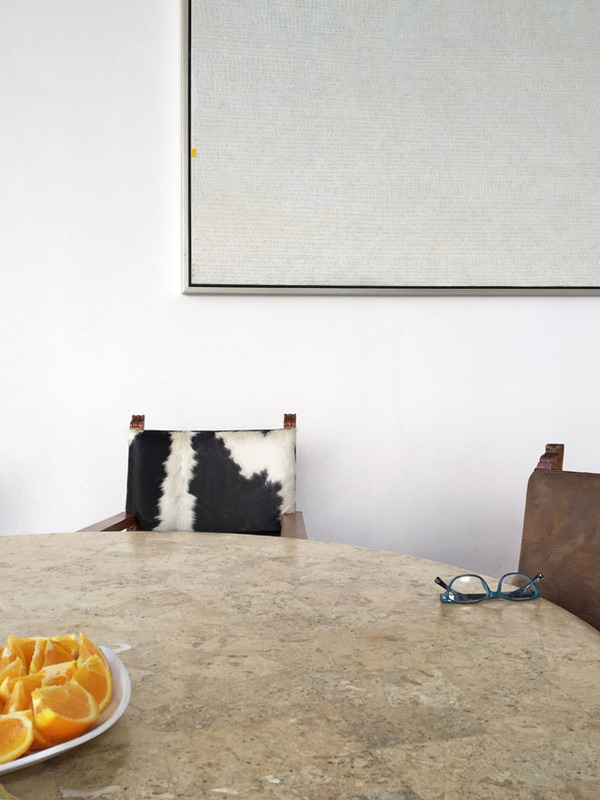 The [furniture pieces] have early midcentury silhouettes, and are upholstered in leather and cowhide,” says Tala. One of the biggest rooms in the house is the master bedroom, with its rounded, built-in headboard, midcentury furniture, and a spectacular view. 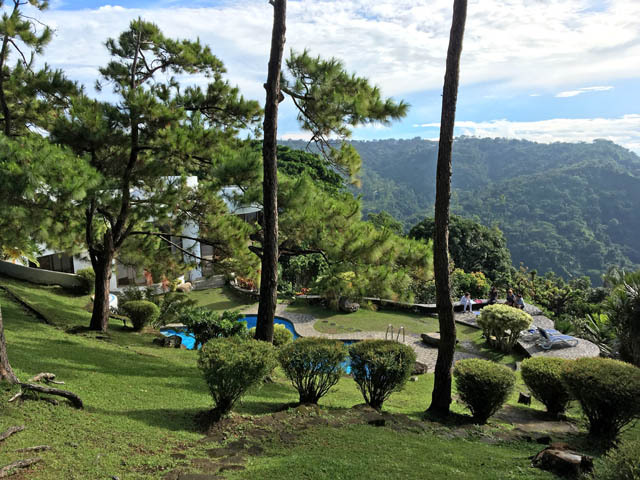 One of the main draws of Raffi’s Way are its outdoor areas and garden, which are perched on a hillside and overlook Taal Lake and Taal Volcano. For more information about Raffi’s Way, visit their website or follow them on Facebook.